Tees Archaeology has delivered a range of activities as part of the Heritage Lottery funded Landscape Partnership Project, River Tees Rediscovered. 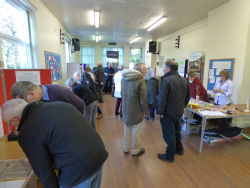 Over a thousand people have enjoyed workshops, talks, guided walks and family events. 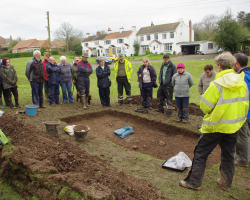 Volunteers have been a key part of the project and over 250 have taken part in excavation, building recording and oral history projects. Aerial photography and geophysical survey carried out by the Mid Tees Research Project identified a possible Roman marching camp at Newsham, 2 miles to the east of Middleton One Row in a loop of the river. 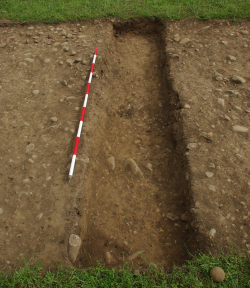 An excavation was carried out by volunteers supported by Tees Archaeology, and this has confirmed the Romano-British date of the features found by geophysical survey. Once it is complete the report will be made available here. 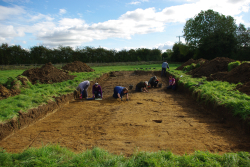 At Low Worsall a series of 1m square test pits excavated by volunteers revealed the location of the lost East Row of the settlement and the pottery found suggested that it had been abandoned in the late 14th century. Traces of a Romano-British settlement were found beneath the southern side of the present village. 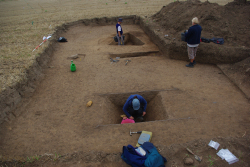 The report on the excavations can be found here. Piercebridge is the site of a Roman fort and we carried out work to the west of the village in an area not previously examined. Geophysical survey revealed a north east to south west routeway parallel to the Roman fort defences, and linked to them. Excavation revealed occupation between the routeway and the fort, but only fields beyond it. The report on the excavations can be found here. Dalton-on-Tees is on the main road to Croft, one of the three medieval bridging points of the River Tees. Investigation has revealed a medieval village with three rows of buildings around a village green. Most of the village was abandoned in the late 14th century, and by the 17th century the village had moved from around the green to alongside the road. A report on this work in 2016 can be found here. Dalton-on-Tees has provided a major surprise with the identification of a previously completely unknown Roman fort, large enough for half a legion, part of the ramparts of which still survive. Once complete, a report on this will be made available. Eryholme sits beside a loop in the River Tees and is a small village surrounded by a range of earthworks. The church is medieval in date but the majority of buildings date from the 19th century and later, and unusually do not occupy former medieval properties. 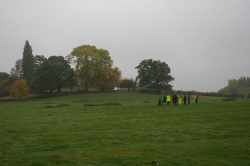 Tees Archaeology has worked with local people and the landowners to organise a geophysical survey and to produce basic descriptions of the earthworks. This has resulted in the identification of further properties of the medieval village, now sealed beneath later medieval ridge and furrow. A report on this project can be found here.